Relief for Family Caregivers | Full Circle Home Care Inc. While caring for your aging parent is a labor of love, it is still labor. As you spend more and more of your time caring for your senior parent, you may find yourself giving up favorite hobbies and vacations, saying no to friends, feeling distracted at work and getting more stressed with your spouse and children. Over time, juggling care giving with work, raising children and managing a household increases your risk for depression, chronic illness and a decline in your overall quality of life. Despite these risks, you may neglect good health habits if you’re like many caregivers. You may skimp on sleep, eat poorly, skip regular exercise, and keep going even when you’re ill or postpone your own medical appointments. If you’re a caregiver who neglects your own health, you’re more likely to suffer from a chronic condition such as high cholesterol or high blood pressure and be overweight. Caregiving can also take a toll on your mental health, with an estimated 46 percent to 59 percent of caregivers suffering from clinical depression. It’s time to pause and ask yourself: “What good will I be to the person I care for if I become ill?” As a caregiver, it is critical for you to take good care of yourself—even while you are taking care of your aging loved one. It is possible to take some much-needed time for yourself while meeting the needs of your senior parent through Full Circle Home Care’s respite care services. Spending quality time with your spouse, partner or significant other is important. However, since you started taking care of your senior parent, you may be more likely to take rain checks on date night. Full Circle Home Care can be there to help your senior loved one while you enjoy a night out. 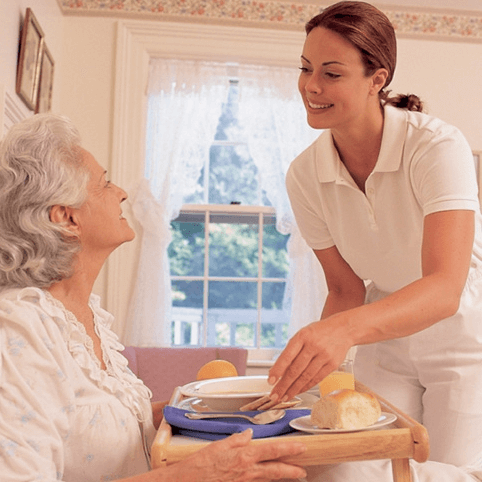 We will assign your elder loved one with a caregiver that can attend to their evening care needs. Date night does not have to be with a romantic partner. Going to dinner or attending a night out with a group of friends is also great ways to enjoy your night. Being social can combat any feelings of loneliness or depression you may feel. Talking with your companions may be a good way to get frustrations off of your chest. Who knows? Your “date” may have ideas and comfort that could help you. When you return home, you can feel better about your role as a family caregiver and continue to provide compassionate care for your loved one. Many family caregivers like you feel guilty about leaving their loved one. They feel that they should not be able to have fun while their parent or other relative is having a hard time. Feeling this way is normal, but it is okay to leave for a few hours when your loved one is in capable hands. Weddings, graduations, business trips, or family events – there are many reasons why you may need to be out of town for a few days at a time. As a family caregiver, you are concerned about your loved one’s well-being, and you may feel guilty for leaving. What if an emergency happens? Take comfort knowing that Full Circle Home Care has a care package just for you and your family: our Out of Town Care Package. When you are away, Full Circle Home Care can be with your loved one. We can help with personal care needs, provide companionship, prevent falls and keep you up-to-date on your loved one’s condition.